A couple nights ago I hosted a Movie Night In viewing of The Red Violin. If you haven’t seen it…do. The movie spans 5 centuries and 4 countries (maybe 5…) anyway- I asked those attending to bring something edible to share from one of the countries represented; Italy, Austria, China, France. One of the ladies, Janelle, brought this adorable caprese salad on a stick. I forgot to take pictures (classic Erin) and we ate most of them BUT there was enough left that I really wanted to eat them tonight…but stretch them for dinner. So I made caprese pizza. It was simple, easy and delicious. So first off, I admit that I bought a pre-made pie crust- I never have before and I never will again. Take the time and buy the dough and make your own crust. Rant over. Put your cherry tomatoes, baby mozzarella, balsamic and olive oil together. If you are going to serve these as an appetizer first, as Janelle did, salt and pepper to taste, thread onto sticks with small basil. If not, omit and keep in bowl while preparing pizza. Take pizza crust and spoon tomato sauce on, leaving a crust. I used a can of crushed tomatoes. It’s cheaper and I like the bite of these tomatoes. Next add your bowl of mini mozzarella, cherry tomatoes, balsamic and oil. Spread evenly across sauced up pizza. Add Roma tomatoes, sliced thin on top of mixture. Add a sprinkling of shredded mozzarella and a little salt and pepper. Bake for 10 minutes. 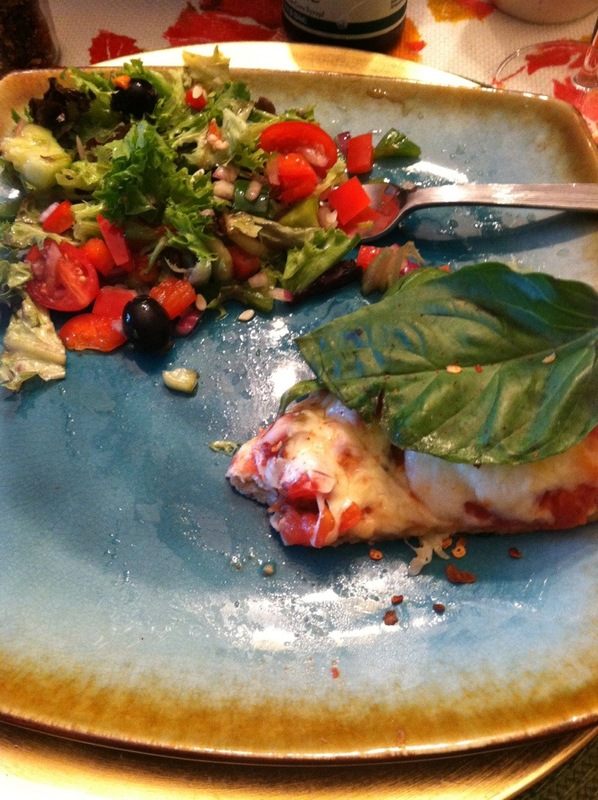 Top with fresh basil and serve with salad. Previous Previous post: Finnish Bread- Breakfast in Bed Anyone?